The other day I got an e-mail from a co-work with the subject line "HELP!!". Very intrigued I opened the email and it was a request to make cupcakes for one of her friend's birthday's. I felt honored that she would reach out to me, but I also felt pressured that I had to make birthday cupcakes for someone I had never met. I knew that I had to make something creative, tasty, and birthday worthy. I know that for my birthday I always like cookie cakes. There is just something about a giant cookie that will put a smile on anybody face. So I went on a quest to find cookie cupcakes, and i stumbled across Beantown Baker's cookie dough cupcakes. I read her post and I knew this was what i wanted to make.A cupcake with cookie dough inside, who wouldn't want that for their birthday?!? So I went to the store, gathered all the ingredients and went to work. The process was easy. Make the cookie dough, roll into balls and freeze for an hour. Then when the cookie dough was soild, mix the ingredients for the batter, put into cupcake liners, and top with cookie dough. It was that easy. 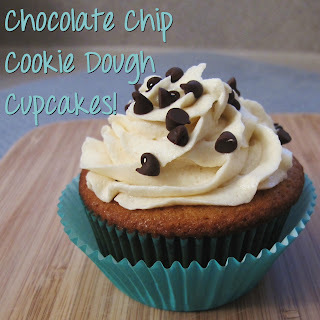 Once they were done, I mixed up the icing, decorated them and top with the left over chocolate chips! They looked perfect. The recipe made 24 cupcakes, and since the box I got to carry the cupcakes only held 20 cupcakes, I had a few left over to share! These cookie dough cupcakes would make any cookie enthusiast very happy, even the cookie monster. Combine the butter and sugars in a mixing bowl and cream on medium-high speed until light and fluffy, about 2 minutes. Beat in milk and vanilla until incorporated and smooth. Beat in the flour and salt until just combined. Stir in the chocolate chips. Preheat the oven to 350° F and line two cupcake pans with paper liners. In a large bowl combine the butter and brown sugar. Beat together on medium-high speed until light and fluffy, about 3 minutes. Mix in the eggs one at a time, beating well after each addition. Combine the flour, baking powder, baking soda, and salt in a medium bowl. Wisk together to blend. Add the dry ingredients to the mixer bowl on low speed, alternating with the milk, beginning and ending with the dry ingredients, mixing each addition just until incorporated. Blend in the vanilla. Bake at 350 for 16-18 minutes. Combine the butter and brown sugar in a mixing bowl and cream on medium-high speed until light and fluffy. Beat in the powdered sugar until smooth. Beat in the salt, milk, and vanilla extract until smooth and combined. Frost the cupcakes and sprinkle with mini chocolate chips! These look delicious! I'll have to try them. Thanks for sharing with us at FFF this week. oh my gosh. this is probably a perfect recipe! they sound delicious. Visiting from Crafty Spies and I love what I see! Looking forward to reading more as your newest reader! This is the most perfect combination of two favorites EVER printed! I think I will try this out for my holiday cookie swap--I don't have traditional cookie swap rules and this would be adorable as mini-cupcakes. Thank you! I shared this and I'm your newest follower, thanks to Crafty Spice's Blog Hop! Would love for you to follow back. Love leftover cupcakes, don't feel guilty then about eating. You know when you have made for someone you feel obligated to give them all. You did a nice job with the decorating. Thanks for the recipe to try. I definitely want these cupcakes for my birthday! Or any day really - LOL! Pinned!